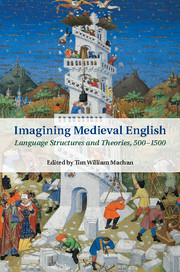 Tim William Machan is editor of Imagining Medieval English - Language Structures and Theories 500-1500 (2016). He is Professor of English at the University of Notre Dame, Indiana. He has published extensively on historical linguistics, medieval English, and Old Norse, with a particular focus on language contact and change. His most recent books include What Is English? And Why Should We Care? (2013) and Language Anxiety: Conflict and Change in the History of English (2009).